I’ve been working on putting together my home management binder for a few days now, and I’m excited to show it to you! I love being able to customize my binder, my way. There are tons of free printables floating around on the web. 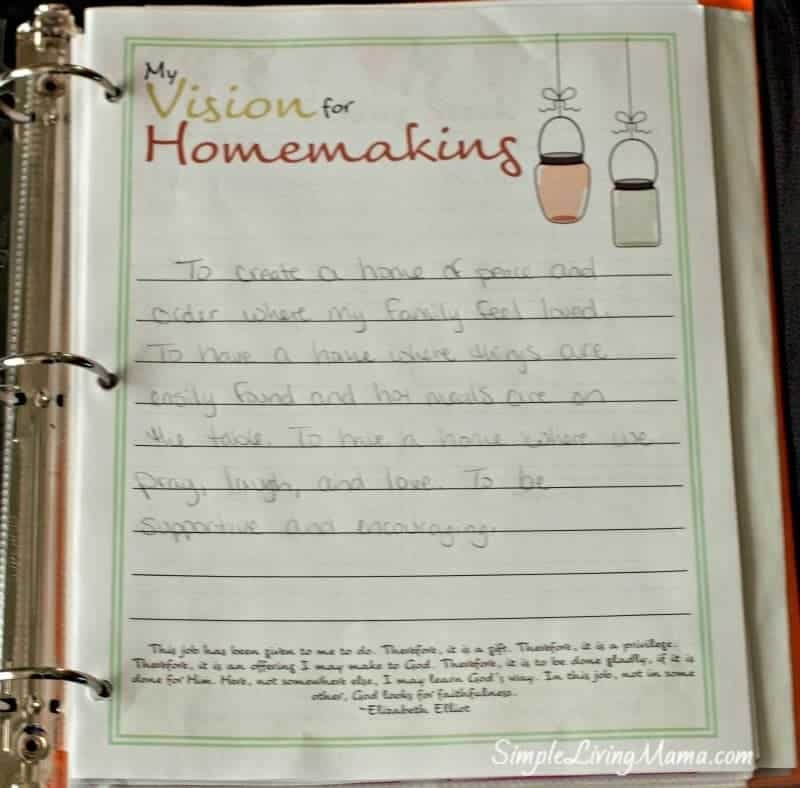 You can create an entire homemaking binder with freebies! Let me show you what I’ve done! Okay, so I started with a big zip-up 3 ring binder. I’m not sure if they even still make these. I’ve had this one for at least 10 years! I love it because I can also keep my journal and my composition notebook in the binder. Just laying in the binder is my Choose Love journal. This is something I have resolved to do almost every day this year. Keeping it right here in my binder keeps it easily accessible. The next thing in my binder is a plain, old composition notebook. I LOVE plain, composition notebooks. I do so much in here. I write down our monthly bills, take notes, and menu plan right in this book. 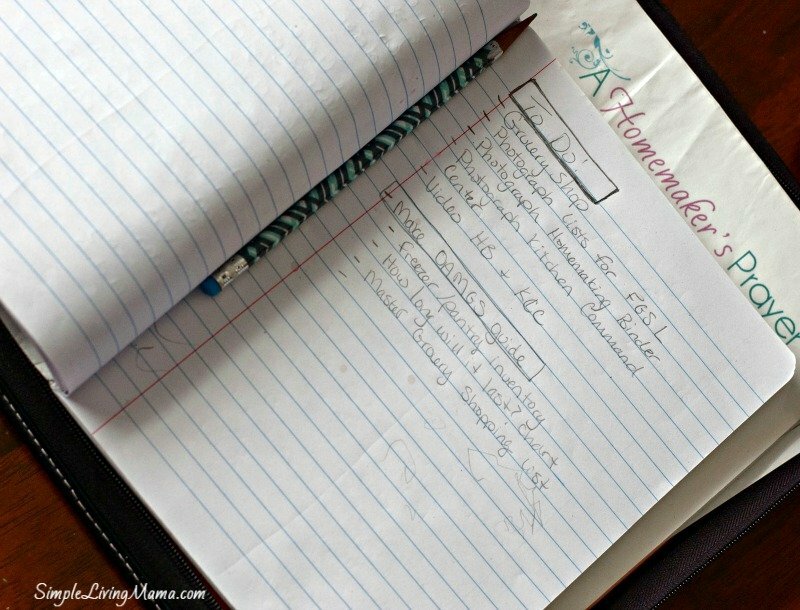 It may be a jumbly mess, but it’s the cheapest, easiest planner I’ve ever used! 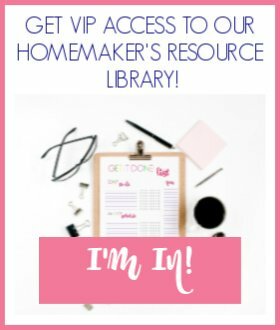 I now have more free printables available right here on the site that you can add to your homemaking binder! Next we have everything that is actually in my binder. 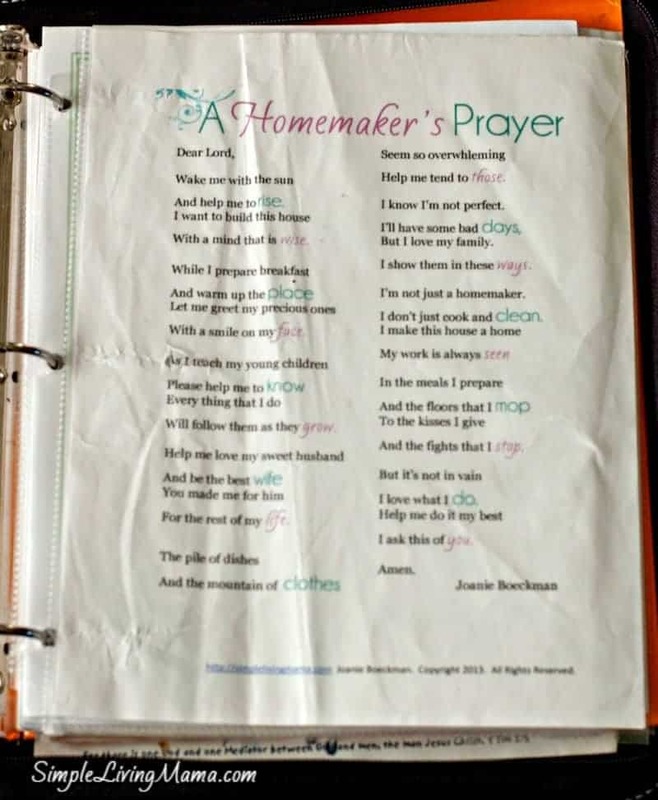 I have a printable that I designed called A Homemaker’s Prayer right in the front. I love this poem. You can tell I’ve had this page a while. On the other side of that I have a printable with one of my favorite verses. It’s nice to remind myself how blessed I am to be a mom to so many children. 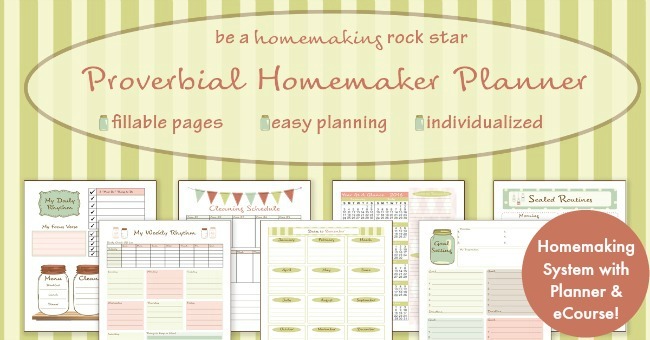 Next, we have the homemaking planner from Proverbial Homemaker. 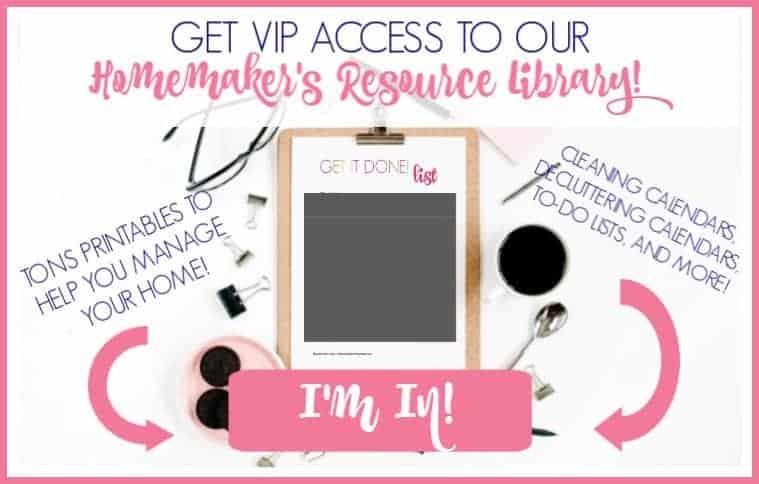 This planner is no longer free, but it also comes with an eCourse that walks you through how to use the planner, and really helps if you are struggling with your homemaking. I haven’t finished filling this out in its entirety, but I have filled out my vision for homemaking and I’ve started working on my routines and my goals. This planner also comes with monthly lay-outs, so I can fill in appointments and events. Behind that planner I have placed my menu planning section. 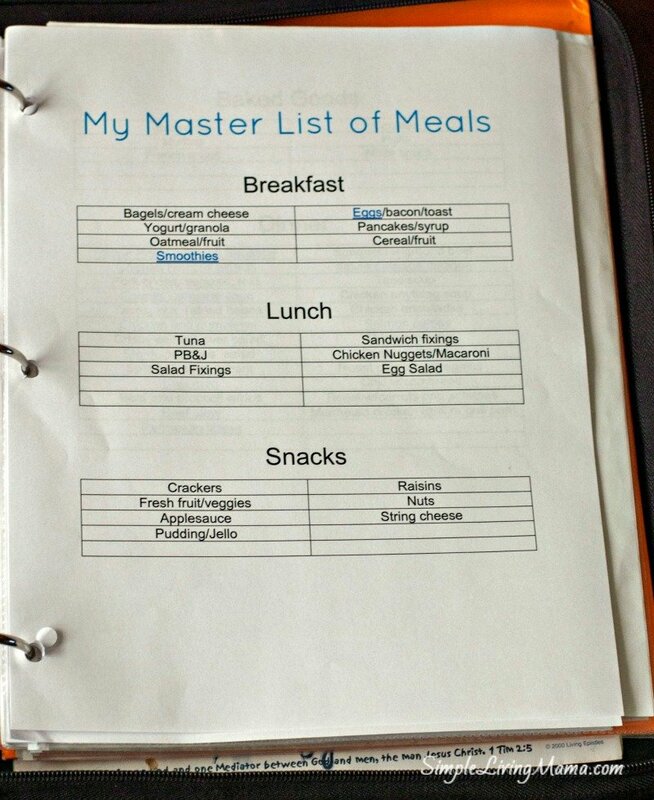 I have a master list of meals that I know my family enjoys to pull from when menu planning, plus my frugal food grocery shopping list. These are all the ingredients we usually keep on hand for one month. I also have a cleaning section with my free monthly cleaning calendars and my homemade cleaners cheat sheet. I now use zone cleaning, and have several zone cleaning lists in my binder, as well. Then I have my personal section. 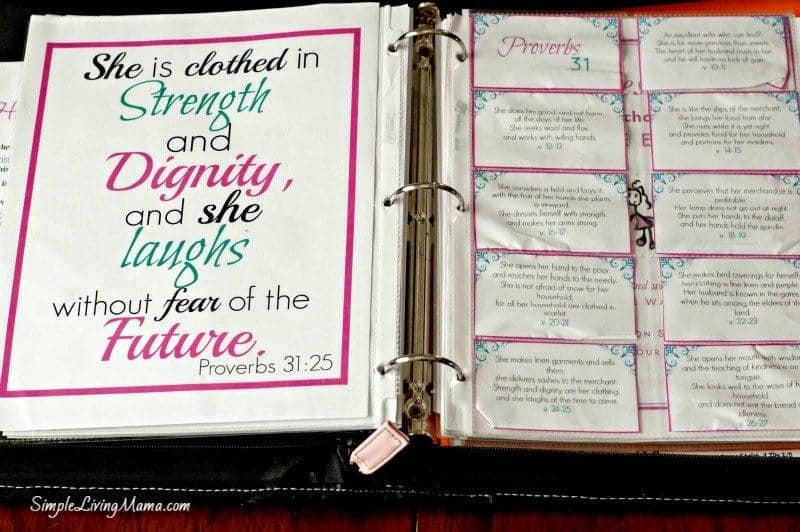 My pretty Proverbs 31 printable marks this page. I placed my scripture cards in a business card holder. They don’t fit exactly, so they are a little squished, but I like being able to look at them when I’m in my binder. I took a course several months ago on Successful Homeschooling. 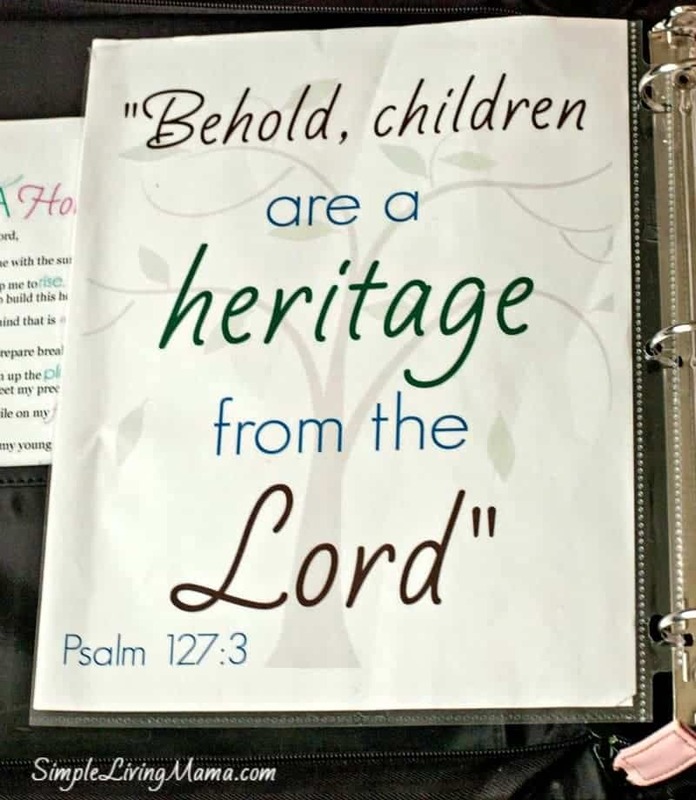 I printed my favorite lessons to keep here in the binder. I also keep other things tucked away in here. I have our Easter curriculum, some stickers, and other odds and ends. 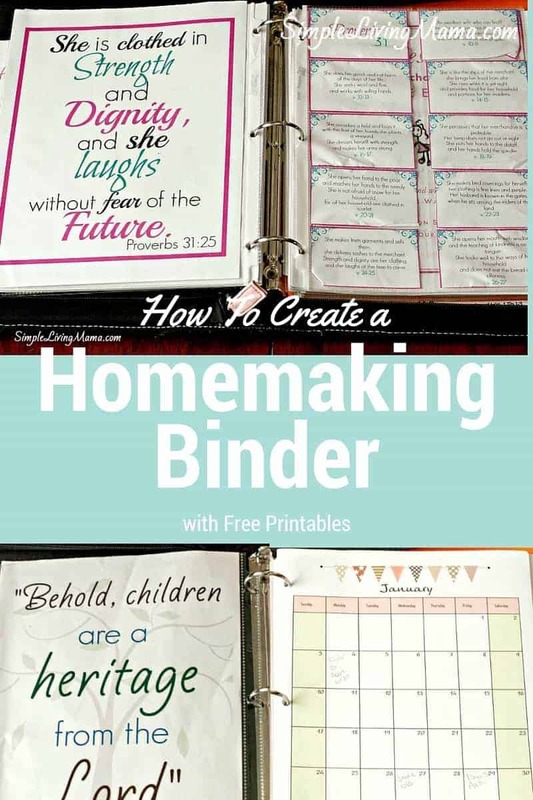 So, that’s how I’ve done my homemaking binder this year. 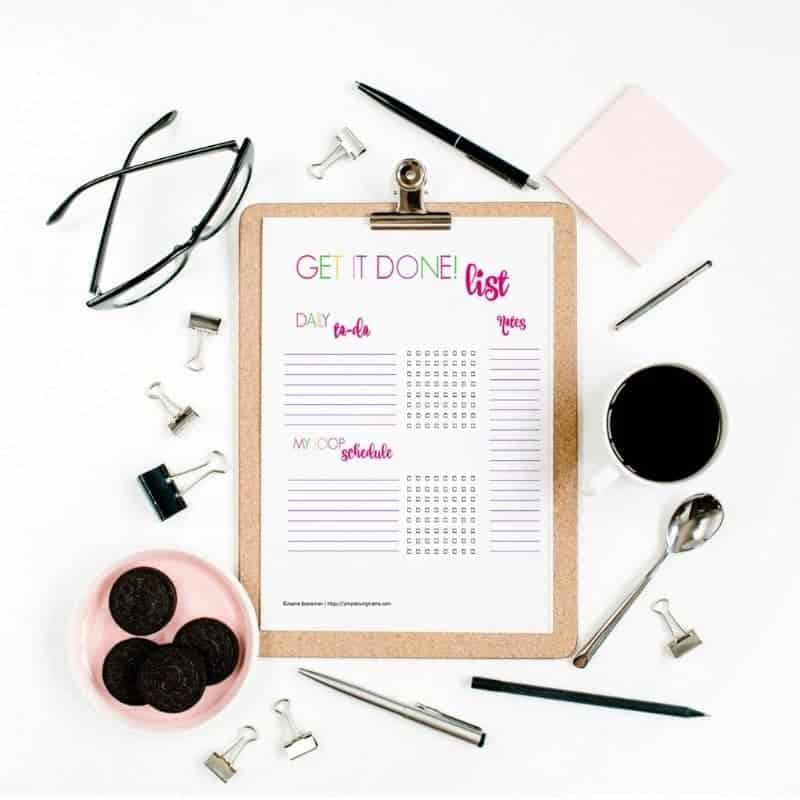 Next week I’m going to show you my kitchen command center, which includes another gem from the Proverbial Homemaker Homemaking Planner, our chore chart, our rewards chart, and my monthly menu plan. This is such an awesome idea! 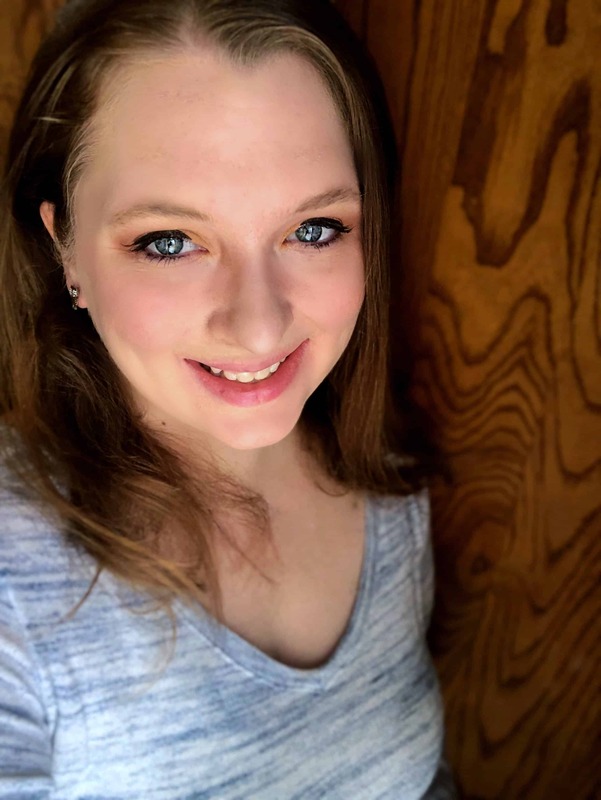 I am just starting out with my blog and I have been struggling keeping up with my homemaking, the very thing I am blogging about. This would help stay focused on why I am doing it all and make everything nice and organized! Thank you for sharing!